After nearly eighteen months into their historic journey, which began May 14th 1804 from Wood River near St. Louis, thence to the mouth of the Columbia River, the Corps of Discovery reached the westernmost extent of their travels. On November 16th 1805 Gass wrote in his journal: “We are now at the end of our voyage, which has been completely accomplished according to the expectations of the expedition, the object of which was to discover a passage [the fabled Northwest Passage] by way of the Missouri and Columbia rivers to the Pacific ocean…” On that same day, Whitehouse wrote: “We are in now plain view of the Pacific Ocean. the waves rolling, & the surf roaring very loud…We are now of opinion that we cannot go any further with our Canoes, & think that we are at an end of our Voyage to the Pacific Ocean, and as soon as discoveries necessary are made, that we shall return a short distance up the River & provide ourselves with Winter Quarters.” Lewis traveled on that day, through Baker Bay, to explore Cape Disappointment and the (Long) beaches to the north. He returned the following day to a place called Station Camp, to rejoin the remainder of the Corps encamped there. The location of Station Camp, where these above journal entries were written, has been established as being across from present-day Astoria, on the Washington side, near the Astoria/Megler Bridge — crossed by the old Nomad the next-to-final day during Odyssey 2004. At Station Camp, the Captains took a vote to decide where best to locate winter quarters. All members of the Corps had a say. Historically, and although not within the then bounds of the United States, this was the first vote cast by either a woman or a black — many years before either would suffer that privilege of citizenship. Of the twenty-eight or so votes cast, the majority chose to cross the Columbia and seek a suitable camp from that upriver side, the belief being that the most elk were to be found there. During the winter at Fort Clatsop, Clark worked his maps and Lewis expanded the field notes he’d gathered concerning zoological, botanical and anthropological data. The Captains also toiled much over their detailed plans for the Corps’ return. The Captains had intended to break winter camp no earlier than the first of April. However, due to the uncertain weather, they determined to set out for the mountains much earlier, there to wait out the snowmelt. 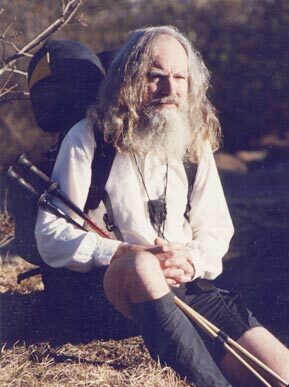 In 2004, the Nimblewill Nomad made his way from St. Louis to Cape Disappointment on the Pacific Coast, just as Lewis and Clark had done with the Corps of Discovery in 1804. In 2006 the Nomad has returned to Fort Clatsop , near Astoria, Oregon, to again walk in the 200 year footsteps of Lewis and Clark, as he follows their return trip of 1806, all the way back to St. Louis — where it all began. The Nomad began his journey at 1:00 p.m. on March 23rd, which is the time and date indicated by the original return expedition journals, and ended it in St. Louis, on September 23, also indicated by the original journals. This odyssey is yet another exciting and wonderful journey, packed full with the spirit of both past and present. So why not come along! Follow the Nomad’s day to day journal entries as he completes this historic journey. After 100 days on the trail, Nomad interrupted his hike to let the Corps “catch up.” He returned to the trail on September 13th. Those final nine days are highlighted below.